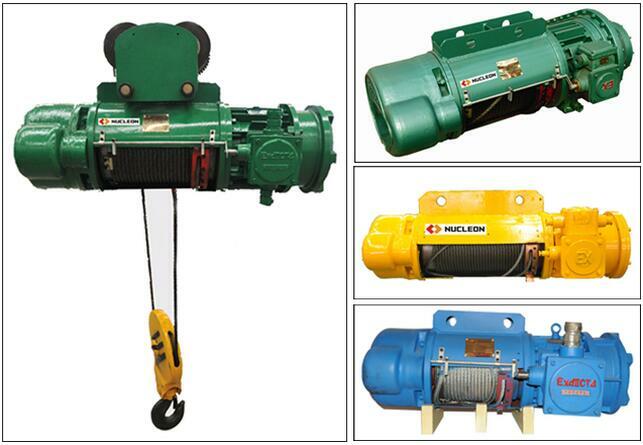 Explosion-proof electric hoist is a special electric hoist. Explosion-proof electric hoist is the most important feature of explosion-proof function, explosion-proof electric hoist is mainly used in flammable gases, dust or mixture of the workshop or plant. Such as mining, chemical, pharmaceutical and other industries. Explosion-proof electric hoist work should be a professional operation of the staff, and familiar with the relevant explosion-proof safety operation. Every day to check the various parts of explosion-proof electric hoist, motor, control box, limit switch, button switch. To ensure adequate lubrication, to reduce the wear of wire rope and parts. When the demolition of the explosion surface should be strictly protected to prevent the collision, resulting in cracks in the explosion surface, resulting in explosion-proof. When the explosion-proof shell has a broken breath, immediately scrapped, install the flameproof shell must be tight for each screw, is strictly prohibited. When the explosion-proof electric hoist is used, it is strictly forbidden to stay in the air for a long time to prevent permanent deformation.